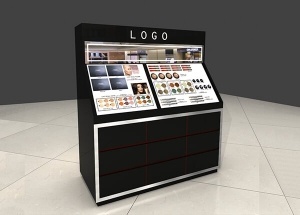 This standard cosmetic display stand: halogen light strip, acrylic displays, storage with hinged door (can lock), toe-kick, laminated deck, levelers, storage cabinet, dust resistant,electrical cord with switch. 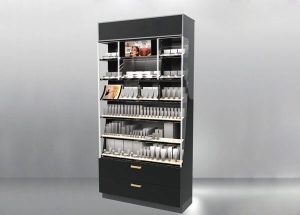 This wall display cabinet is used to display perfume,skin care product,makeup in perfume shop,makeup shop.The display stand is made by wooden(MDF),tempered glass,metal fixture,LED lights,light box,etc. 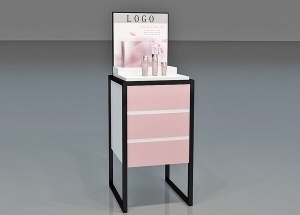 We are a floorstanding cosmetic display stand manufacturers in china. 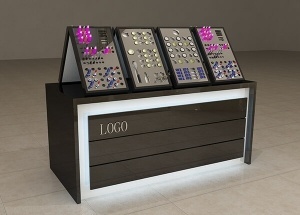 we can make this cosmtic display stand square or rectangular. 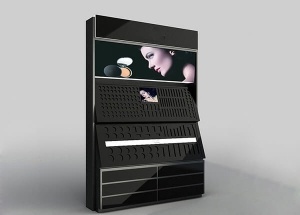 This black makeup counter display is used to display lipstics,eye shadow,blusher in makeup shop,makeup kiosk in mall.The countertop acrylic display stand can be made by any size to fit your project.The display counter is made by wooden(MDF),glass,LED lights,etc. 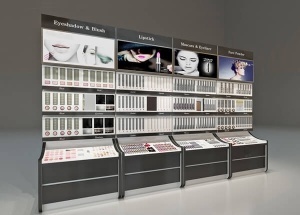 This black cosmetic display fixtures: halogen light strip, acrylic displays, storage with hinged door (can lock), toe-kick, laminated deck, levelers, dust resistant,electrical cord with switch. 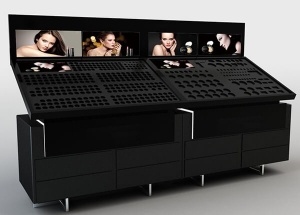 This black makeup counter: laminated deck, black acrylic display stand, halogen light strip, storage with hinged door (can lock), toe-kick, levelers, storage cabinet, light boxes, dust resistant,electrical cord with switch. 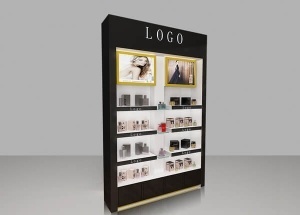 This wall cosmetic display racks is used to display makeup,perfume,lipstick,skin care product in makeup shop,makeup kiosk in mall.The display rack is made by wooden(MDF),acrylic,metal fixture,LED lights,etc.